Like many who survived Nazi horrors, Mireille Knoll embraced life, eating out and going to the theater despite limited means. Even as age and Parkinson's disease took their toll, she delighted in receiving guests — until one of them allegedly stabbed the 85-year-old to death because she was Jewish. "I thought I was going to die on the spot. I cried all the tears in my body and I thought of her. She didn't deserve this," her anguished son, Daniel Knoll, told The Associated Press Tuesday, near the Paris public housing project his mother called home for most of her life. "How can one do that to anybody? The police revealed she was stabbed 11 times." As Knoll's family gathered in Paris to attend her funeral on Wednesday, horrified French leaders and activists called for people to take to the streets to protest racism. Paris Mayor Anne Hidalgo urged all Parisians to join a silent march in memory of Knoll on Wednesday, and politicians across the political spectrum pledged to attend. French President Emmanuel Macron tweeted his "absolute determination to fight against anti-Semitism." 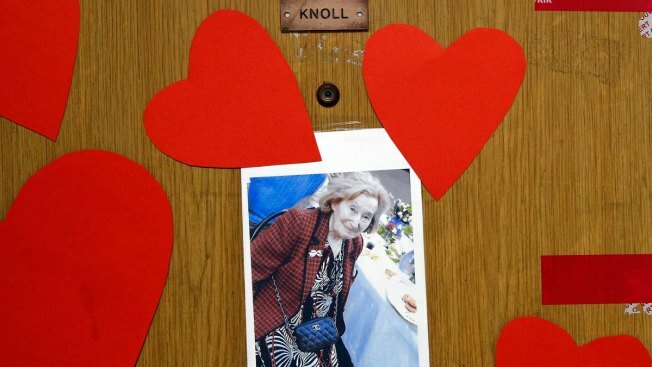 For Knoll's family, the killing was a cruel coda to her long life. At age 9, she fled Paris to escape a notorious World War II roundup of Paris Jews. French police herded some 13,000 people — including more than 4,000 children — into the Vel d'Hiv stadium in 1942 and shipped them to the Auschwitz death camp in Nazi-occupied Poland. Fewer than 100 survived. "There was nothing to steal. My mother was poor," her son said. "Her credit card? She would have only been able to withdraw 100 euros. She had no money on her account." Daniel Knoll said the suspect had lived there since he was 7. His mother "took pleasure in having him at home and ... although we'd asked her not to welcome him, she let him in like she always did, the same way she did with everybody, with kindness," he said. "My mother had a thirst for knowledge and meeting new people and talking to them and that's what killed her," he said. Knoll's granddaughter, Jessica, lashed out at the attackers who "burned all of our memories, burned my entire childhood that I experienced there, in photos, albums, souvenirs." "She used to run faster than us," she told the AP. Daniel Knoll remembered his mother as talkative and vivacious. In a home video she could be seen raising a glass and declaring, "Lechaim!" — "to life!" in Hebrew. When she could still walk, he said, "she was going to restaurants, to theaters, to cinemas to see movies. She likes so much to read, she likes life so much. All those people who know war, they like life, maybe more than these crazy people" who killed her. Mireille Knoll's husband was deported to Nazi concentration camps, and their wartime experiences colored their children's lives. Yet, despite a resurgence of anti-Semitic violence and vandalism in recent years, and anti-Israeli sentiment among many young French Muslims, Daniel Knoll said he didn't feel targeted for being Jewish. Granddaughter Jessica, however, warned that "today it is my grandmother and tomorrow it will be a grandmother, a grandchild, someone else's father." Jessica Knoll, who emigrated to Israel as a child 20 years ago, urged the French to "stop making excuses and see reality for what it is." The French Jewish group CRIF compared Knoll's killing to that of Sarah Halimi, 65, who was beaten and thrown from her balcony last April. That murder was reclassified as anti-Semitic last month. The suspect is in a psychiatric hospital. France's government presented a plan earlier this month to fight racism and anti-Semitism, focusing on social media and prevention in schools. It also wants to change French law to force internet platforms to detect and remove illegal content. Associated Press writers Angela Charlton in Paris and Areej Hazboun in Herzliya, Israel, contributed to this report.